While climate change is a real concern for us all, there has not been a lot of noise about it on the music front so far. Committed climate action pioneers in Finland, however, include the Lahti Symphony Orchestra and the Flow Festival, both of which wish to set an example to other music organisations and provoke them to reflect on how to best participate in this endeavour that requires all humanity’s involvement. A recent promotional video released by the Lahti Symphony Orchestra portrays musicians dressed differently to their regular concert attire: everyone, including the conductor, is wearing a bicycle helmet. The orchestra aims to gradually achieve carbon neutrality, as the first orchestra in the world. To begin with, the orchestra commissioned an assessment to calculate its carbon footprint, in collaboration with the Environmental Technology Unit at the Lappeenranta University of Technology. The next steps will be to minimise emissions as much as possible and to compensate for the rest. ”One important observation was that what makes a big difference is how our audiences travel to our concerts. Playing Sibelius in our home town does not in itself represent a big environmental burden, but the audience transport proved to be a significant area for change”. The project is still in the early stages and suitable methods of compensation are being researched. For this, it is crucial to find the right partnerships. According to Kirjonen, Lahti is an ideal city for an environmentally conscious orchestra, with its active and ambitious endeavours to profile itself as an environmentally friendly city. Encouraging its citizens to ride bicycles is one of its key projects. Lahti is applying for the title of the European Green Capital 2021, having been a finalist in the last two application rounds. "If we can reach people through art, and if we are able to introduce this important issue on the side, why wouldn’t we do it?" The Lahti Symphony Orchestra’s original approach has managed to attract international attention. In spring 2018, their project was awarded with the Classical:NEXT Innovation Award, and Kirjonen has been in demand giving presentations about the project, from Europe to New York. He says the project has faced no criticism so far, and even those who were initially amused have since come to understand the significance of the endeavour and begun to reflect on their own contribution to environmental action. It is possible that this overarching theme will manifest itself in the orchestra’s programming and artistic direction as well. Kirjonen says that many composers have already started to reflect on the theme. 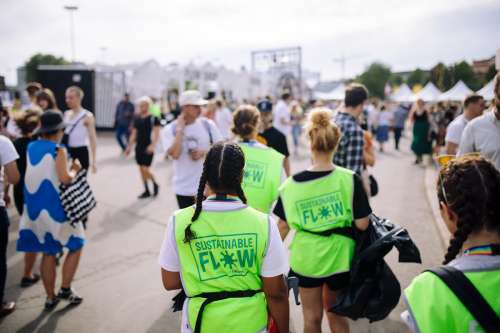 The Flow Festival, organised in Helsinki each August, is one of the first carbon neutral festivals in the world. The festival - with 84,000 attendees in 2018 - has continued to compensate for its carbon footprint since 2009 by contributing to various environmental projects. This year, the festival announced their success in many of their goals. ”Despite attracting larger audiences compared to last year, we managed to reduce the amount of waste by 21 percent. In addition, we achieved a 9.5 percent reduction on the CO2 emissions caused by energy consumption”, the festival’s marketing manager Milla Valjus explains. The conscious urban audiences tend to make choices that make it easier for Flow to commit to its own responsibility program, Sustainable Flow. Valjus says that as much as 46 percent of the meals sold during the 2018 festival weekend were either vegetarian or vegan. Audiences make their way to the festival mainly by foot, by bicycle or by public transport. However, presenting a large international festival does not come without its environmental challenges. ”Most of our carbon emissions are caused by our artists’ flights, and this is something that is difficult to address if we want to keep our program content international and interesting. Let us hope that the future will bring a range of alternative travel methods and that airlines will increase their use of more sustainable aviation fuels”, Valjus says. One future goal for the festival is to further increase the availability of vegetarian and vegan foods. “Perhaps our future festivals will also introduce edible plates and cutlery, which would further reduce the amount of waste”, Valjus envisages. Greenpeace Finland’s digital marketing manager Jani Sipilä, who also has years of experience of working in the music industry, sees the shaping of public opinion as one of the central ways for the music industry to be able to chip in. As an example, he mentions “Hands Off the Antarctic”, a song released in October by Thom Yorke in support of Greenpeace’s campaign to protect the Antarctic. In Finland, Greenpeace has collaborated with the violinist Pekka Kuusisto. Their joint video project, featuring the sounds of Kuusisto’s violin through a barren-looking clearing in the forest, will be released this autumn. However, there are many other avenues to explore for making a difference, due to the many and varied facets of the music industry: travel, transport, energy consumption, food production and waste processing. It is particularly the massive-scale events that really need to wake up. The music industry’s environmental responsibility was the topic in a panel discussion at the Music & Media Finland conference, held in Tampere this October, and an idea was raised to create a common list of goals for all Finnish festivals. Sipilä states that while Finnish and Scandinavian festivals are generally very progressive in terms of issues like recycling, there has to be more information available and the standards need to be set even higher.